5 Ways That Life Reminds Me That I'm in My "Mid-40s"
I just got new glasses. Exciting, right? Hold on. I promise this is going somewhere. During my eye exam, the doctor assured me that I would soon need reading glasses. That came as a complete shock and surprise. I asked how she knew. I mean, maybe I have really healthy eyes? After all, reading glasses are for grandmas and stuff. She responded by saying something to the order of, "Well, at your age..." Wait one damn minute??? AT MY AGE?!?!?!?? What's that supposed to mean????? 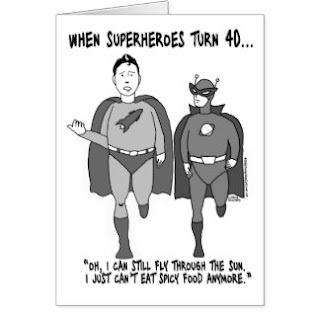 Oh, yea, I'm in my "mid-40s." And people who are "over 40," well, they need reading glasses. For the eye doctor, I'm certain that this was one of many similar conversations in her day. But for me, it served as yet another reminder that the years have accumulated. Students tell me, "Yea, my dad likes that too." Seriously? I mean, my kids are 9 and 6. And I am SO MUCH COOLER than your dad! Sure I don't know him. BUT JUST LOOK AT MY VAMPIRE WEEKEND SHIRT!!!! I enjoy listening to Neil Diamond. Thanks Rick Ruben. He produced Neil Diamond's 12 Songs, which is nothing short of brilliant. For me, though, 12 Songs has been a gateway to all of Diamond's earlier stuff. Sure, I still cringe every time I hear "Sweet Caroline." But man, that guy has a long history of being awesome. Or at least, that's what Mid-40s Me thinks. Mornings mean new adventures in stair climbing. I have been a "morning person" for all of my adult life. When I lived in Florida, my usual routine was to get up at 5:00 AM and meet a friend for a run thirty minutes later. I still wake up early. But my muscles don't. There are many mornings when my first trip up our stairs to the coffee pot is on all fours. Then, the first steps of my morning runs tell me that my muscles stay sore longer, and that what flexibility I once had is rapidly diminishing. There is all kinds of stuff that I can't eat anymore. Two years ago, I spent an entire day making seafood paella. This dish had it all: lobster, squid, clams, oysters, and shrimp. It was a delight. The next day, though, found me rushing between my bed and the bathroom (not to overshare or anything). I soon discovered that I have a "shellfish intolerance." While not an allergy, people "of my age" can develop an inability to digest shellfish. I also can't do wings. I don't know if it's the heat, the grease, or the vast quantities of beer that accompany these glorious bundles of saturated fat. But even one wing=a sleepless night. Downton Abbey is my idea of a perfect Friday evening. OK, to be honest, I've always been like this. "Hey man, we're going out to the bars." Single me: "Yea, but, the X-Files..." So I guess I had some good practice in my 20s for my 40s. You are not alone my friend. Bifocals (or "transition lenses" if you want to use the gentler term) are next on my to-purchase list.